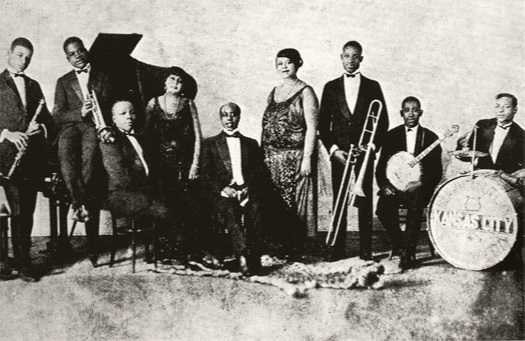 A 1923 Okeh promotional photo of Bennie Moten’s Orchestra, with Mary H. Bradford (fourth from left) and Ada Brown (sixth from left). From 1980s tape transfers supplied by the late Mike Stewart. Charles Hibbard was the recording engineer for Okeh’s 1923–1924 “recording expeditions,” according to reports in various issues of The Talking Machine World.